Lego has just announced the creation of a set of female scientists ready to be sold in their Series 11 Lego Minifigures. The toys will feature female scientists and their lab tools will be devoid of the colour pink. The idea had been submitted by Stockholm geochemist Dr. Ellen Kooijman and won over many other ideas when put to vote at Lego Ideas, which is where the public vote on project proposals for future Lego toys. But the question that struck me when I heard about this was: why didn’t this happen sooner? 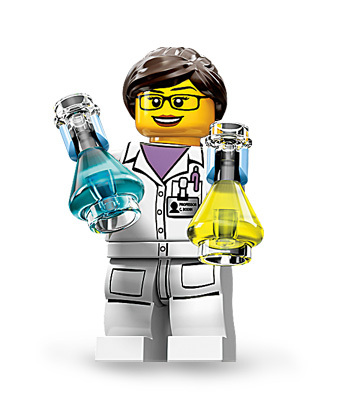 Female scientists have been around since before Lego was branded and yet they are only releasing these toys now. Mattel beat them to the scientific bang when they added palaeontologist, computer engineer and architect to Barbie’s list of careers, but they were criticised for these career choices because they were still viewed as too pretty and too pink to be taken seriously. Nowadays, these particular Barbies are near impossible to find on store shelves. But that’s not to say that Lego didn’t try to sell these types of toys. In the past, Lego released scientific-related Lego toys but these were not popular due to their lack of detail and reliance on stereotypes. They were engineers with nerd glasses and scientists portrayed as crazy haired and, frankly, evil, which didn’t exactly show the scientific community in a positive light. These new toy figurines will hopefully usher in positive attitudes towards scientists, especially females. If this set shows promise and there is good interest in the set, more will follow. But it really comes down to what children want to play with. The issue goes back to marketability of the toys as well as the media’s representation of science: there just aren’t enough positive scientific portrayals in the media for children. Most toys in stores are usually geared towards specific, gendered trend – cars, buildings and robots for boys and Barbie, baking and homemaking for girls. So this scientific set will be released with little to no scientific interest or reinforcements. Marvel releases action figures of the Avengers and their ensemble, but in the television show Agents of Shield, Jemma Simmons is a bio-chemist and though she is a part of the Marvel Universe, there will be no action figure made to showcase Simmons occupation. The same could also be said for The Big Bang Theory. The show is a network hit with millions tuning in to watch a group of scientists and their lives, but there will not be any Amy Fowler scientist toys available in toy stores, with only comic book stores selling bobble heads of The Big Bang Theory cast. So Lego has a lot riding on the release of these toys, but this is where it starts. They are taking one small plastic step forward in altering their past of severely criticised gender marketing campaigns, to one of a better female and occupationally equal range of toys. When the Research Institute hits stores in August, there will hopefully be enough interest in the toys to be able to expand the set into other fields. This entry was posted in News and tagged gender, gender stereotypes, News, toys. Bookmark the permalink.